Secure learning success in the long term. The persolog Learning and Teaching Model helps you to shape your learning processes efficiently. Learning and Teaching behavior will be aligned. › Learn. Understand learning styles. › Effective. Optimize learning behavior. › Learning. Teach with higher participant orientation. Lengthy inefficient trainings are part of the past. Now you can offer seminars with sustainable effective learning success that rouse the participants’ interest. Each one of us learns differently. The persolog Learning Style Profile enables teachers/trainers/coaches to determine learning styles quickly and reliably and to adapt their trainings accordingly. Learners will find it easier to optimize their learning behavior. 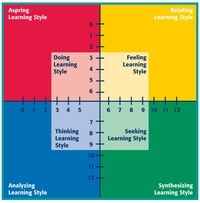 The persolog Teaching Style Profile helps teachers to optimize their teaching style. Improve your didactics/principles of teaching and pool of methods. Trust in science and practice. On the basis of the behavioral research by Prof. John G. Geier, Renate Wittmann, expert in adragogics, developed the persolog Learning and Teaching Model in cooperation with teachers from vocational schools and management trainers. Each seminar is different because each participant learns differently. Acquire the target-oriented methods in the certification seminar for the persolog Learning and Teaching Model.